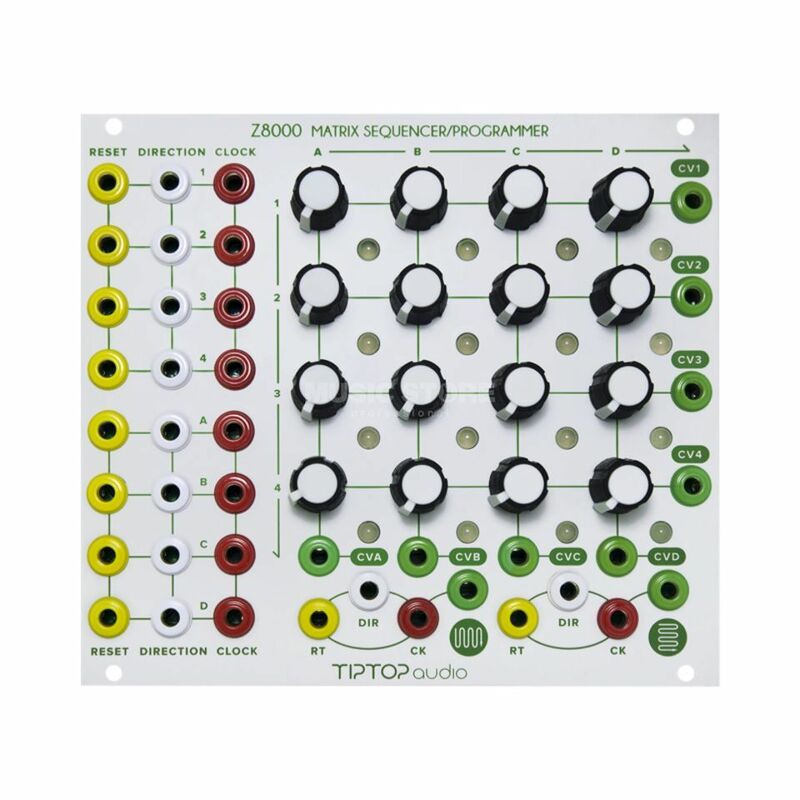 Tiptop Audio Z8000 Matrix Sequencer is a sequencer module for modular synthesizers in Eurorack format. The accessible sequencer houses a clock divider, clock sequencer, switches, trigger sequencer and logic gates that create a unique system. With the Z8000, multiple parameters can be modulated simultaneously polyrhythmically, resulting in unprecedented motion. One control acts on all ten CV outputs, and all clock inputs can be controlled at audio rate. Tiptop Audio has added some additional technical features to the Z8000 Matrix CV Sequencer Version 2, besides a refreshed, colorful design: the CV output can now be set between 0-5V or 0-10V via switches on the rear panel. Each of the ten CV outputs is independently adjustable. A reverse power protection guarantees the protection of the module and the adjacent modules in case of persistent faulty conditions. The new sockets and potentiometers provide a better operating feeling. Since TipTop Audio entered the SONICriderSTUDIO the matrix sequencer is one of the last modules that was on my wish list. BTW: rating sound with one star cause this module doesn't make any sound on itself. This sequencer has 10 sequencer inside the options of making an unique, experimental melody an easy step. 8 4 steps en 2 16 steps sequencer. Each sequencer has his own clock, direction and reset input. Using a TipTop Trigger Riot on several sequences triggering tempo, direction and reset creating a complex sequence is a new way of making melodies with a constant change. When routing the output to a attenuator/mixer mixing several Matrix outputs is a way to obtain unique & constant changing melodies (even more when the summarized output is fed into a quantizer. The magic starts turning one knob and influencing 3 sequences in one time. The knobs are solid and easy to use. Running all sequences on a different speed, changing direction & trigger the reset delivers endless stream of pitch CV's. If you like experimental melodies or steady constant sequences (and everything in between), this modules does is it all. The output of the sequence can also be used for short gates (option to pas the output through a ADSR). Summarized: a TipTop Audio quality tool that has so many options that it can be the heart of many styles of music.